This time of year childhood memories come flooding back and this week I can't seem to get out of my head a little Welsh Christmas song. 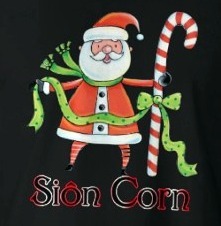 We used to sing it to welcome Sion Corn (Santa) to the Christmas Party at the Chapel that I used to go to. Any of my Welsh friends remember it?? Pwy sy'n dod dros y bryn yn ddistaw ddistaw fach? A rhywbeth yn ei sach? A phwy sy'n eistedd ar y to ar bwys y simne mawr? helo, helo, tyrd yma, tyrd i lawr. Who is coming over the hill very very quietly? with something in his sack? and who is sitting on the roof besides the big chimney? hello, hello, come here, come on down. We have some favourites for bedtime - 'Nefol Dad' is one, and for some strange reason she likes me to sing the Welsh National Anthem! 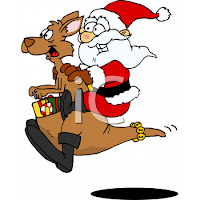 At a recent Christmas party here in Queensland the children sang Jingle Bells to welcome Santa. It was the traditional Jingle Bells - the "dashing through the snow one". (No one seems to get the irony of this!). However....there is another version...a very Australian version that I just have to share. Sing along and I'll translate! So my girl and I have quite different Christmas songs﻿. Robin flew away, Wonder Woman lost her bra bosom's, Flying TAA - hey!